Pfister Faucet Review- How Good Their Faucets Are! How good is Pfister faucet and what customers are saying? What I like and what I don’t about Pfister faucets? Pfister v/s Delta faucet – which one is better? What is about Pfister v/s Moen? Pfister is quite an old faucet manufacturing company in the United States and one of the best bathroom and kitchen faucet brands in the world. They have been a premier producer of top end faucets for some decades. According to some reports, it is a common choice for many US residents because they are highly effective and they are much more efficient than regular faucet brands. What more excites people to buy them, is its design and immaculate finishing that holds the prowess to beautify any design in bathroom or kitchen. Today we are here with the Pfister faucet review. We have got many requests from our readers to do a review on Pfister faucets. So here are we! Let’s start reviewing without making delay. Pfister is quite a well-known brand who has been making faucet for many decades, and they have never come out with an inefficient product. All the products carry a unique design pattern which is inspired by different types of cultures, and they rightly fit into any decor. Apart from design, the facilities it provides in its faucet is indeed commendable, and this is the reason many people prefer them from others. Moreover, they include many modern technologies which you will hardly find in others. Customers mostly in America are delighted with Pfister faucets, and they have hardly found any significant complaints about their product (except some models). Instead, customers are happy with their performance, design, finishing, feature list, build quality and convenience. However, some customer often complained about their price structure. I like to start with the liking of Pfister faucet which includes almost every part of the device as it doesn’t offer any room to dislike it. In design section, Pfister is like the pioneer because they bring out various vintage as well as modern design in their faucets. Almost every tap are loaded with advanced technologies and facilities so that they can assist the owner in every way. Pfister faucets also provide many unique facilities like pull-down head, soap dispenser, 360-degree swivel, decorative deck plate, nylon supply line, etc. Moreover, all safeguarded with Pfister seals and Pfister lifetime warranty on the product make sure it entirely safe from any leakage. Apart from that we really liked the fact that all of their faucets are approved by many governing bodies as they meet their standard requirements. When it comes to disliking, there is a hardly particular factor that I didn’t like about Pfister faucets but mostly its price structure. But yes, if you can afford, that could be your best decision! The price of their most taps are quite high, so it is not possible for everyone to own them. Secondly, the weight of some of the faucets is also high which is a big concern for me. The debate between Pfister and Delta is never ending as some people prefer Pfister product while some prefer Delta. Various users have a different opinion as they are the primary judges and according to the survey, many people have admitted that would prefer Pfister faucet over Delta in some states while Delta is more popular in other states of the US. Pfister faucet is an outcome of almost 100-years experience in the industry. Professional designers design all their products. The design and coating are applied in an ingenious way that makes sure it can last for a long time and fulfill their purpose. With top-notch quality, they also bring the best design so that it can beautify where they are fitted. Both Pfister and Moen are two large companies with huge experience, and they produce quality products in the market. However as we have previously discussed the debate over which brand is better, entirely depends upon the customers. So after proper scrutiny of all the reviews from customers, we can say Pfister gets the upper hand in the market. It excels in almost every whether it is functionality, design, durability, feature or price. Moreover, Pfister is always known to provide the best quality at a decent cost that acts as a long-term investment. We now have top 10 Pfister faucets that our experts have selected for both bathroom and kitchen. Our expert team have reviewed these 10 faucets and hope you will be able to choose the best one from here. For our top pick in the kitchen section, we have selected Pfister GT529 WHS Wheaton single handle faucet, and it rightly deserves its position. It holds a sophisticated yet straightforward curved beauty that allows it to fit into any kitchen design. When we first laid our hand on this product, we really liked its brawny quality, simple curve, active soap dispenser and 1.8gpm flow rate. It is a complete package, and its high functionality gives it an upper hand in the market. Pfister GT529 WHS is one such model that completely wowed us with its performance, design and build quality. It didn’t give us any room to dislike any of its parts but specific features like its soft pleated lines, soap dispenser, flow rate, useful deck plate and Wheaton docking system. So, this is the top pick here in the Pfister kitchen faucets review. This one is one of the best faucets we have on our Pfister Faucet Review list. Pfister GT529 WHS is a compact package that suffices a lot of requirements in the kitchen, and it is due to this reason it has so many happy customers. The curvy design with soft pleated lines and classic outlook gives it complete upper hand when it comes to outlook. It is built using stainless steel and blended with a shiny finish that makes suitable for kitchen decor. You can comfortably fit this model because it comes Wheaton which is an advanced docking system and a brawny deck plate. The manufacturer has designed it in such a way that it gains high arch so that it can have proper clearance between the mouth and sink bottom. Pfister GT529 WHS is a high efficient tap that offers 1.8gpm flow rate at a 60psi pressure which is enough for kitchen use. Moreover, it comes loaded with a top filling soap dispenser bearing same archetypal design and the soap easily comes out in one quick snap. You can use the faucet to spray stream in any direction which is useful in reaching inaccessible areas. Moreover, it comes loaded with 36inch integrated nylon supply and female fitting thus it resents you from spending extra on the water line. Lastly, it has a highly durable tap that is corrosion resistant and bending too thus ensuring colossal longevity. If you are looking for a stylish yet highly efficient faucet and won’t mind spending money on a quality product, then Pfister GT529 should be your next purchase. You will be delighted to know that it also comes with a lifetime warranty on its functionality as well as style so you can stay assured that it would last long years. 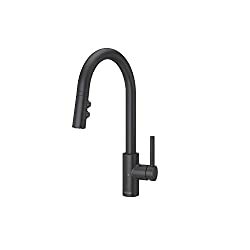 Pfister LG529ESAB is a touch-free kitchen faucet and probably one of the best Pfister faucets you will ever come across in the market and experts are drooling over its performance. It was nominated in various awards in home decor category due to its innovative technology and high functionality. You can turn on-off the water without touching the bar! The best part of this faucet is it will automatically stop after the 3 minutes of inactivity. Pfister LG529ESAB Stellen tap is one of those articulate kitchen items that steals all the limelight in the kitchen. It comes with a classic smooth arch design that adorns a matte black finishing. It carries a single handle that is only oriented for a forward move that allows easy installation. The head section serves as the crucial part as it brings three functions and they are a stream, pause, and spray facility. It can sit comfortably with any standard kitchen as it offers excellent height from the sink and moreover Pfister has been designed model by taking inspiration from contemporary loft living. The 1.8gpm water flow rate you get with Pfister LG529ESAB is mindboggling, and it solves most of the problems with washing. What set this spout aside in the crowd? It’s modern Reach Sensor technology that offers a touch-free response by switching on the tap when you move your hand near the valve. Not only that it also provides SmartStop technology that automatically checks the water flow after three minutes of inactivity. With this model, you can even adjust the temperature by position the handle. These gizmos provide to operate it using both the plug-in option or battery backup. An intriguing part of this model is that it comes with a 3-hole deck plate. Pfister LG529ESAB can be an ideal addition to your modern kitchen decor if you want to use a faucet adorned with modern technical features. It is an unusual model that also offers advanced ceramic disc valve technology that ensures that you won’t every face leakage issue. Pfister is America’s one of the oldest plumbing company who have always satisfied their customers with top-notch plumbing product, and F-529-7ANS is also one of them. This model comes with an ultra modern styling carrying various sharp curves throughout the body, and it has only one handle. This radiant design packs a pull-down facility that will allow you to toggle between spray and stream. This elegant faucet also bears a 15.63inch height, but the molding process is done in such a way that it fits any sink. Most importantly it comfortably fits in the pan, but it is only compatible with 1 or 3 hole sink. When you start using Pfister F-529-7ANS, you won’t be able to complain about its flow rate because of it boasts 2.2gpm. The intriguing part of this model is that Pfister has molded long-lasting ceramic disc valve. It is entirely free from lead and it NSF 61/9 Annex G Lead certification serves as the proof. Unlike faucets from other brands, it supplies you with all the required hardware although you have to buy supply line separately. The whole body is molded with a top-notch brass material; thus you can guess how much longevity it will provide. If you are remodeling your kitchen and you want to spout that will go well with the makeover, then there is no better option than Pfister F-529-7ANS. Once you get this model, you won’t have to pay for any damage because Pfister provides a lifetime warranty. Moreover, it is also ADA compliant which ensures it would stay with you for a long time. Pfister Hanover 2 is an outcome of sheer craftsmanship that offers an excellent layout with performance. The manufacturer has loaded it various crucial attributes like a soap dispenser, Anti-splash sprays volume control technology, AccuDock technology, Pforever seal, volume control lever and pulls out spray head with two functions. But still, when compared with Pfister GT529 WHS, it fails due to lack of three functions in spray-head. When you take the first glance of Pfister Hanover two handle pull-down kitchen faucet, it will immediately make you wooed with its old European aura. This model blends the shiny black color with the Tuscan bronze touch on both the ends. It has been designed in such a way that it offers high arc spout so it can provide proper clearance between nozzle and sink bottom. The top section comes with a pull out two function sprayer and also a lever with anti-splash volume control technology so that you can easily control water pressure. Not only that the pull-down section even gears an AccuDock technology which you will hardly see in product from other brands. Even though Pfister Hanover two handle kitchen faucet carries a neat and fantastic outlook, but it brings some massive power, and you can judge this fact from its 1.8gpm flow rate at 60psi. It comes with two separate handles for smoother operation, and they both carry same parental design. It also features a 360-degree swivel which adds to the usability of the spout. However, it’s top filling soap dispenser serves as the highlight in the whole setup. Pfister provides all the required amenities with this model that includes deck plate and water line. Like other Pfister models, the creators have sealed it with Pfister ceramic valve technology that ensures zero leakage. Pfister Hanover pull-down kitchen faucet is loaded with a lot of certification like NSF, ADA, CEC, Cal Green, etc. and this proves you can completely rely on this product. So if you are looking add an artistic yet modern spout in your kitchen, then this model might be your right choice. Our lab experts have examined a lot of Pfister faucet. Pfister stainless steel Wheaton kitchen faucet can be associated with the title of one of the highly reviewed faucets in the kitchen segment. Most of its users hail this product for its durability, usability, and design. But sadly, Pfister GT529 WHS wins over this model when it comes to longevity and feature count. However, it is a beautifully designed tap that carries many vital facilities that you won’t usually find on standard spouts. Pfister stainless steel Wheaton kitchen faucet has that outlook to outshine its competitors only by its design rather than performance and durability. It offers high arc support with a single handle and pulls down spray head for toggling between spray or stream which is an essential requirement for homeowners. The wavy outlook with simple lines and stainless steel finish on this spout can easily beautify any kitchen sink without any doubt. The whole body is constructed using brass so you can guess its build quality. Interestingly, it is compatible with one, two, three or four hole installation which is a boon to many people. Using Pfister stainless steel Wheaton kitchen faucet on a daily basis is quite easy, and it only comes with a single handle for simple operation. Not just that, but you also get a soap dispenser which serves as an added benefit. It offers a 1.8gpm flow rate which is marvelous as it will assist you to finish all the washing process quickly. While washing, you can move the faucet in any direction as it offers 360-degree swivel. The installation process is quite easy, and you won’t require buying extra water supply line as it is preloaded with 36inch integrated nylon supply line. Pfister stainless steel Wheaton kitchen faucet could be your ideal faucet in the kitchen as it will be swift up all the kitchen process and grace up the decor at the same time. Lastly, you will get a lifetime warranty on this model, and it covers the functional parts as well as the design. Pfister LG042VGKK Vega bathroom faucet is a high-quality bathroom faucet from Pfister that brought a smile on the face of a considerable number of customers. It is an amalgamation of modern design with classic outlook, and this kind of centerpiece is mostly prevalent in royal houses. It might look small, but this dynamic package carries many features that you will hardly find in other spouts in the same segment. We can say it gives a neck to neck performance with Pfister GT529 WHS but lacks in height in height when tallied. Pfister LG042VGKK Vega bathroom faucet is a cheaper faucet from Pfister that has caught the attention of many buyers. It holds a modern Vega polished lines along with a meticulously added brushed nickel color scheme, and this takes the whole waterfall design to a whole new level. Moreover, the flow of water from the spout is eye-catching sight and whenever you will see it will merely bring satisfaction in your mind. It comes with a single metal lever control which works with a simple feature touch. The brass construction provides this spout a robust build quality which is essential in the long run. Pfister LG042VGKK Vega bathroom faucet is a striking beauty that will also woo you with its performance, and 1.2gpm serves as the proof. It is also water sense certified so you can stay assured that you will get the same rate as mentioned. It is sealed with Pforever ceramic valve technology that will bar all kind of leaks in the spout. The manufacturer also supplies you a push and seal drain assembly that you can easily install in the sink. You will even get a single post mounting ring and decorative deck plate with this model which will be a boon to you. Pfister LG042VGKK Vega bathroom faucet works flawlessly, and it adds a glow to any bathroom decor. If you are longing to add an exclusive spout in your bathroom that will make a statement, then this faucet should be your choice. When we talk about Pfister Ashfield two handle widespread bathroom faucet, the only thing that comes to our mind is an immaculate vintage beauty with top-notch performance. Even if you try but it won’t provide you much room to dislike it in performance, design or build quality. Although you are more likely to get attracted to its waterfall design, rustic bronze body finish water flow rate, TiteSeal deck plate, and effective two handle system. According to us, it is a great product, but it fails to gain the top due to its water flow rate. Pfister Ashfield two handle widespread bathroom faucet is described as a classic looking top of the line bathroom faucet that holds the prowess to outshine its competitors. You can stay assured that it won’t bug you with any damage because it is built using sturdy metal. It comes loaded with advanced ceramic disc valve technology that has been introduced by Pfister to block any kind of leakage. When it comes to design and color scheme, it stays in the front, and all the credit goes to its clean waterfall design with rustic bronze color. You will 1.2gpm water flow rate with Pfister Ashfield two handle widespread bathroom faucet, and it is decent for a regular bathroom. You will be delighted to know that it meets EPA WaterSense standard that depicts it curbs down the wasting of water by a large margin. This model comes with a lot of amenities, but TiteSeal deck plate takes all the limelight as it abolishes the need for putty. Not only that, but it also comes with Pfast connect that not fasten up the installation process but also protects the water supply line. Lastly, the manufacturer pays a lot of heed to the health of their customer, and thus you won’t find any lead in its body material. Do you have an affinity for elegant looking faucets? Do you want to add them to your bathroom? If yes then go for Pfister Ashfield two handle widespread bathroom faucet without any second thought. Another sparkling Pfister faucet on our list is LFM40YP0Y Ashfield single control bathroom faucet. It is a single lever spout with a tall stance that offers an ideal of sturdiness and vintage outlook. It is a lucrative spout that lures its buyers with a fascinating set of attributes which comprises waterfall design, country style body line, decent flow rate, single lever and lot of color options. You might ask why didn’t it gained the top spot? It is because it doesn’t have soap dispenser and water flow rate that Pfister GT529 WHS possess. Pfister LFM40YP0Y Ashfield bathroom faucet is a vintage looking single hole model that comes with a long stance and countryside design. The whole body carries a Tuscan bronze color scheme which assists this faucet to become an eye candy amidst in the crowd. It offers a single lever construction along with a waterfall inspired spout mouth that gently allows the water to drop down gently. The exciting part is that you have to make a soft touch to switch on or off the water flow process. It is one of those models that can fit well with all types of decor in a bathroom but mostly classic outlook. Pfister LFM40YP0Y Ashfield bathroom spout is a correctly built model that hasn’t compromised on anything, and its Pforever Seal serves as the proof. You will get a 1.2gpm flow rate with this model which will be sufficient for your common purpose. The installation process won’t cost you substantial extra money as the manufacturer includes single post mount ring, valve, and cartridge with the package. Not only that, you will even get a grid drain assembly which would come handy. Like most of the Pfister bathroom faucets, this high-end product carries Cal Green, ADA, NSF and WaterSense certification. If you have a traditional looking bathroom and looking for an excellent spout enhance the overall aura, then Pfister LFM40YP0Y Ashfield bathroom spout could serve as a useful spark. Even though it is little pricey, but it worths every buck you spend on this magnificent product. Pfister LG49M0BC Marielle bathroom faucet is an artistically designed model that carries a lot of curves and sleek lines throughout its body. It is one of those cheaper faucets from Pfister although it would be unwise to underrate this model depending upon its price point as it offers top-notch design and facilities. However, Pfister GT529 WHS beats it when they are tallied against each other in looks and functionality. Since we are reviewing Pfister faucets here, we won’t mention any other brand’s faucet for now. But we can assure you that the review of other’s brand faucet is coming soon. Pfister LG49M0BC Marielle bathroom faucet is one of those models that holds prowess to force any buyer to buy the product with just its looks. French country design inspires it, and it bears many subtle curves with smooth lining. To make things more interesting, the whole body including the handles is molded with polished chrome which can easily beautify any bathroom decor. It might look sophisticated and fragile from outside, but in reality, it is built using sturdy raw material that will last for a long time. Not only that, but advanced ceramic valve technology also seals it that promises to keep the spout running without any leak. 1.2gpm is the water flow rate of Pfister LG49M0BC Marielle bathroom faucet which is sufficient for typical houses, but if you need more flow, then you can opt for 1.5gpm. Both the handle works quite efficiently, and you will also have the option to change the direction of the faucet depending upon your convenience. You can mount this single hole tap either on the countertop or sink deck. During installation, you won’t have to worry about anything because it comes with all required amenities like a valve, cartridge, water line, and push & seal drain. If you are planning to buy a spectacular faucet for your new bathroom, then you should go through the review of Pfister LG49M0BC Marielle bathroom faucet. If you are worried about its credibility, then remember it is approved by ADA, CAL Green, NSF and EPA WaterSense. After adding Pfister’s four faucets, LF049YW2K Ashfield 2-Handle bathroom faucet is the last one in this list of Pfister bathroom faucet reviews, and it rightly deserves its position in this list. It is an exclusive faucet that bears a countryside outlook and houses many crucial features. The most highlighting part of this model is its price point that makes it an entire value for money product. Despite its incredible pricing and performance, it was unable to beat Pfister GT529 WHS due to the astonishing finishing and design of the GT529 faucet. Pfister LF049YW2K Ashfield 2-Handle bathroom faucet is an economic model from the manufacturer that offers you a traditional design with brushed nickel finishing. The spout mouth is adorned with waterfall structure which allows proper distribution of water. Not only that whole body is of eight inches so you can expect a decent gap between the mouth and bottom of the sink. Once you get this model, you won’t have to worry about its durability as it is built using nickel and offer ceramic disc valve technology that bars any kind of leakage. The manufacturer has also introduced physical vapor deposition finish that ensures it doesn’t catch any corrosion. Pfister LF049YW2K Ashfield faucet also gears a handle bearing the same design, and they are quite light as well as efficient to use. This model provides a 1.2gpm water flow rate that makes it a standard spout in the bathroom rather than a showpiece. The installation process of this model is quite simple, and you won’t get extra equipment as it comes packed all the necessary items. It also comes with Pfast connect facilities that help you to hook the spout to the water supply line securely. You will be bamboozled to hear that it saves a lot of water on a daily basis and the WaterSense approval serves as the proof. If you are looking for an inexpensive yet efficient faucet for your new bathroom, then go for Pfister LF049YW2K Ashfield toilet faucet.